12/27/2018: Last update for the night... or rather, early morning. I need to be up in a few hours to get ready for work and probably should have stopped about an hour ago (or maybe two), but I was on a roll. Two more doors to go! 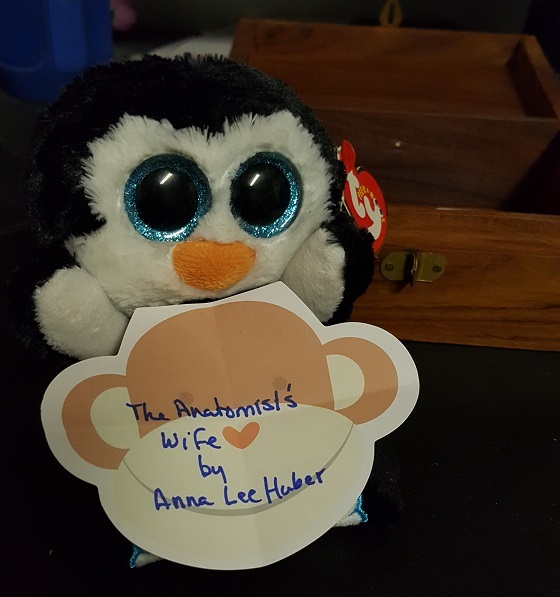 Completed the first three tasks, skipping the fourth task, and had the Book Task finished since early November. Four points total! Your 2019 Book Goals: what are they? I considered posting a separate 2018/2018 - Year in Review - Looking Forward to Next Year thing... but at the rate that I'm going with the blogging right now, I doubt that post will ever see the light of day. In fact, I haven't even started planning said post yet, so here we go just responding to this task. Since 2017, I've been trying really hard to maintain a "Year of the Laid Back Reading." This was basically my way of curbing how many reading challenges I signed up for and how many reading goals I made throughout the year, because I tend to sign up for a million challenges, and then stress myself silly over completing everything like my life depended on it. In 2019, I would direly love to continue on with being more lax about my reading, but I'm feeling that I need some direction. - Both 24in48 readathons -- first of which will be January 26 - 27 // Sign-ups are now open! - The 2019 Halloween Bingo at BookLikes, if it gets hosted again! 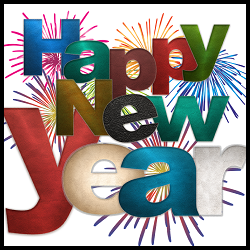 - The 2019 Festive Tasks games -- looking forward to any new twists and challenges! And as per usual, one of my biggest goals is to try to knock out more books on my already owned shelves, both digital and physical. 2018 Reading Year in Review. Tell us about your year in books: happy? disappointed? This year I had the most universally worst reading slump I've had since I was in college. But at least then I had reasons--studying and going to school and working and homework... y'know piddly stuff like that to keep me from reading for leisure. I always start my years and end my years with a bit of a slump. My reading years are usually pretty parabolic (I think that's the right word), with my best reading months more towards the summer time (because I don't like outside when it gets too hot). But this year I started with a slump, thought I was seeing some improvement by March, let it drag out for a few more months, tried to read something, finally picked up a nice burst of "I'm just going to read everything by Jayne Ann Krentz" wherein I crawled out of my slump for about a month, started reading other books, then dropped back into a slump, managed a short, impressive burst in October to celebrate Halloween Bingo... and am pretty much now just tapering off to my usual end of year slump. HOWEVER, I still managed to read 100 books, as of today, 12/27/2018. In big part, I'm grateful to all things Jayne Ann Krentz, whose books managed to yank me out of my slump as the mid-year rolled around. Halloween Bingo also played a pretty big part, even if only for one month. As far as quality of books, I've found a good number of new series and authors I'm interested in continuing to follow, but looking at my list of book rankings, it was a pretty mediocre year. Unfortunately, it also felt like a less than mediocre year with a lot of books I just could not find it in me to like, much less love. Highest ranking book this year up to this point is Deanna Raybourn's A Treacherous Curse. Lowest ranking book was Midnight Sacrifice by Melinda Leigh. Favorite new series includes Seanan McGuire's InCryptid series, which I'm extremely looking forward to continuing. Most read author this year is, obviously, Jayne Ann Krentz. I read thirteen 2018 new releases. I finished at least eight completed series, and caught up with five ongoing ones. I've read nineteen new-to-me authors, and... started a bunch of new series that I'm not even going to bother counting. All-in-all, despite what felt like the Mother of all Reading Slumps, I did surprisingly well this year. Probably just not what I'd been expecting, but we can't be too greedy now, can we? 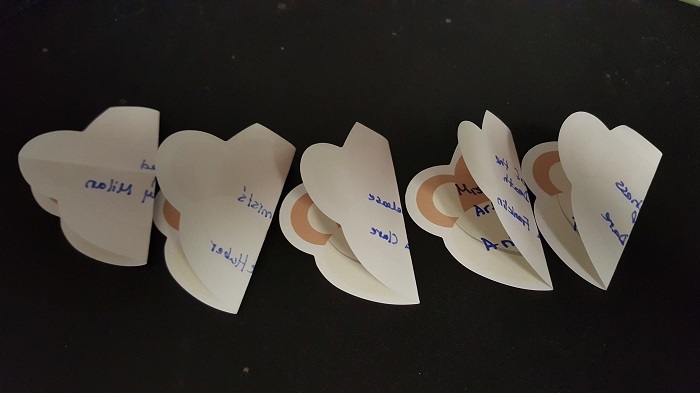 New Year’s Book Lottery: Write the names of the first 5 books you’re planning to read in 2019 onto identical pieces of paper, fold them, place them in a bowl (or bucket, jar, box, etc. ), and draw one to determine the very first book you’re going to start in the new year. Alrighty! 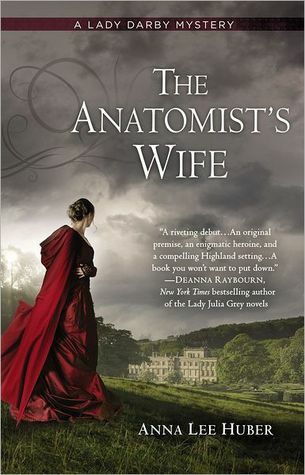 Since part of my 2019 Reading Assignment Challenge goals (of which I have yet to list) will involve reading more Historical Fiction (of any subgenre including mystery, romance, general, etc. ), I chose five specific books, all of them the first in a series, to place in this lottery. 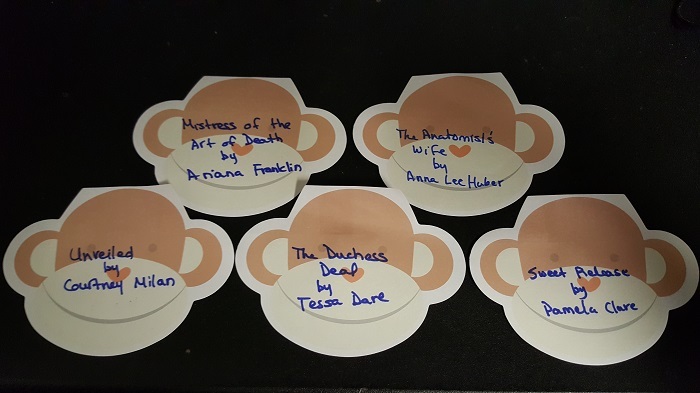 On five monkey post-its, I wrote down five historical fiction books (three historical romances, two historical mysteries). 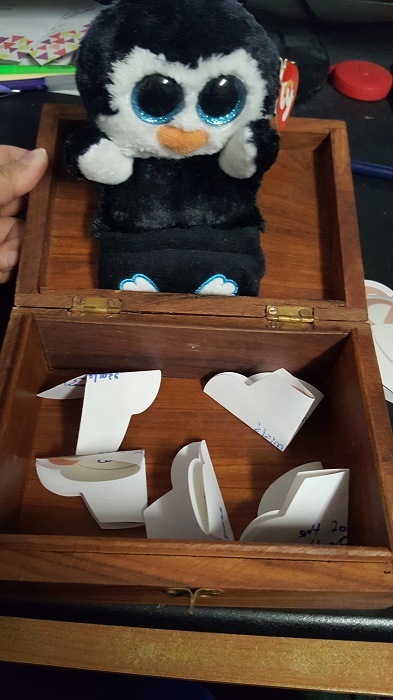 Then I folded each monkey post-it in half... and realized that maybe I shouldn't have written in blue marker, because the writing bled through and I can see the titles clearly. So I folded them all once more and pulled out my pretty box for shaking it all up! And here is Penni watching supervising the lottery to make sure there is no cheating! I have totally been looking forward to this book! Yay! Looks like I will be jumping right into this one, first of the year! Find a bakery that sells Krapfen (German deep-fried sweet dough dumplings) or make them yourself (recipe here: https://germangirlinamerica.com/rheinische-ol-krapfen-new-year/) and enjoy with a glass of champagne or non-alcoholic bubbly drink – but first, take and post a photo of them! I've got the points I need. I'm good for now. Read a book about endings, new starts, or books where things go BOOM! This seems like a fitting book for new beginnings endings... stuff like that. This book is also the November read for The Flat Book Society. 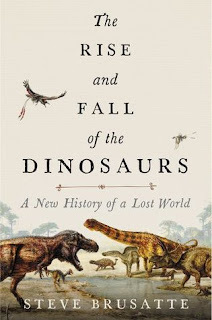 I sort of read and skim-read parts of the book and here's my review.